World Class Fishing~ Included in all our Cruises! Yes, you read that right. 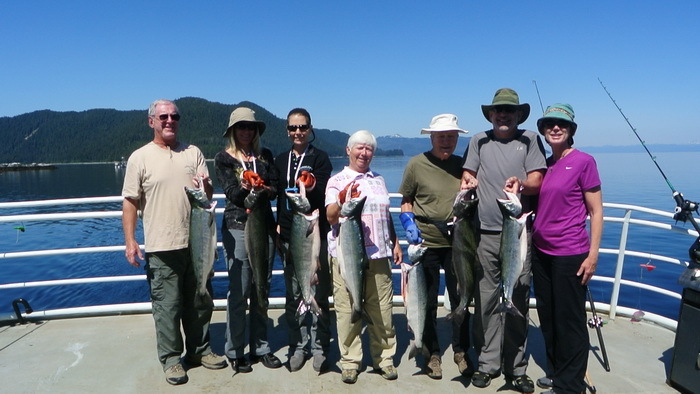 Fishing with Custom Alaska Cruises is included at no extra cost. Not to brag, but all of our cruising excursions are free. Ok, maybe we’re bragging a little, but that’s the exciting part. Once you cruise with Custom Alaska Cruises, everything on-board is free, zilch, nada. The fishing season varies depending on when you want to cruise with Coastal Alaska Adventures. 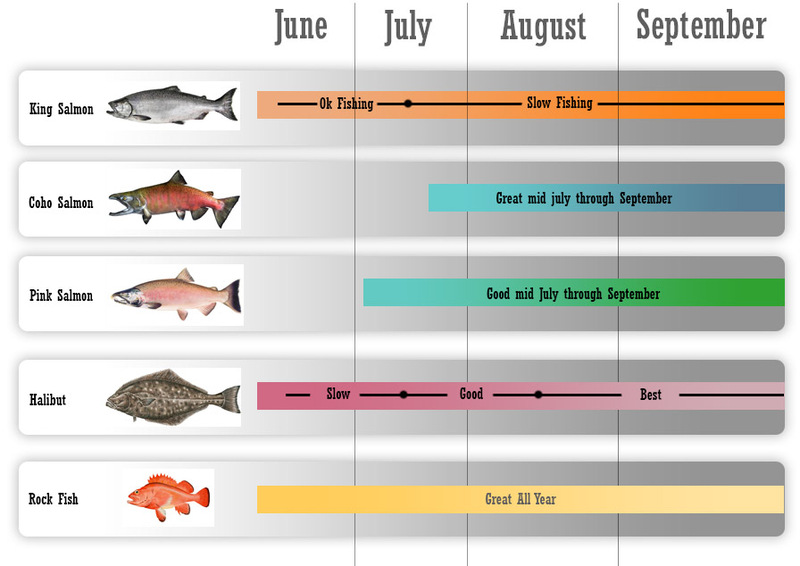 If you are looking to catch a specific species, the chart below will show you when the best time to cruise is. So you don’t have to worry about how much to pay for a fishing package. As long as you purchase a fishing license when you arrive, you can fish for whatever you want… Halibut, Salmon, Rockfish, Ling Cod and more. This is your Alaska Fishing Cruise! We like to call it Alaska’s best All-Inclusive Cruise. 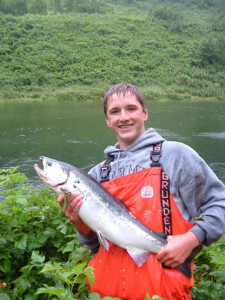 Custom Alaska Cruises offers a variety of ways to enjoy world-class Alaska fishing. Our boats have 4 staterooms, so bring your closest friends and make this into a private Alaska yacht charter! There is great fishing off the deck of our boats; but if you want a serious sport fishing charter, these need to be organized before your Alaska cruise along the Inside Passage. Fresh water fishing opportunities are available as well, but can only occur with an independently licensed guide service. The fishing in Alaska’s Inside Passage will far surpass what you find in the neighborhood pond. Here, we set you and your children up for some quality bonding and a once in a lifetime experience. We have bait, tackle, and expertise ready just for you and your family. Nothing beats the thrill of a fish tugging on that line. Get your camera ready, because your child’s catch will make an excellent photo opportunity. For teens and adults, we can set up private charters. Simply fishing off our deck also makes a fantastic father and son activity. We will set you up for fishing success aboard, your Alaska small boat cruise. Anglers from all of over the world hear Alaska calling, and nothing draws them quite like the huge schools of salmon that migrate north with the summer sun. These fish head to our cold, clean waters to grow and then swim upstream to spawn the next generation. You too can partake in this incredible experience by fishing aboard. We catch a wide variety of saltwater salmon and we can charter out a sport fishing vessel if you crave the thrill of a freshwater catch. Each variety of Salmon has a distinct flavor and appearance. Here is a list of the species that are often caught in our waters and from our decks. Join us to try your hand at catching all of them, so you can decide which you like best. We sail out and away from the big ships, into places that only a small Luxury Alaskan Cruises can take you. Our unique experience offers better wildlife viewing, more peace and quiet and relaxation, better beachcombing, and, you guessed it, better fishing. One of the most sought after, and most photographed catches in the region is the Alaskan Halibut. These fish are long and flat with a sweet flavor and fewer bones than most other catches, making them an ideal treat. Alaskan Halibut fishing is some of the very best on the earth. Fishermen from all around the country are drawn to Alaska’s enormous Pacific Halibut every year. These monsters frequently reach sizes of several hundred pounds. Custom Alaska Cruises conducts cruises of all varieties throughout southern Alaska. Multiple types of fishing excursions are available, as are a vast array of other activities, such as hiking, kayaking, whale watching, and photography. 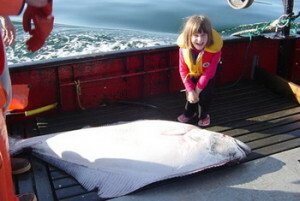 Custom Alaska Cruises is an ideal way to access your Alaskan halibut fishing vacation. We have all the rods and tackle necessary for Alaskan halibut fishing. Her comfortable interior is a welcomed reprieve from the sometimes harsh Alaskan outdoors. After a long day of hauling halibut out of the water, you’ll be happy to relax in the comfortable salon or retreat to your own stateroom for some solitude. 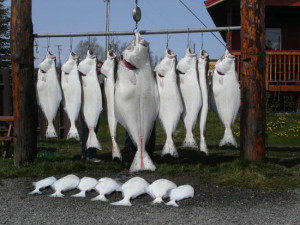 On average, a full-grown halibut usually weighs around 80 pounds, with the largest ever caught weighing more than 500. Many of our guests have caught one of these from the comforts of our deck, and we will be happy to fillet and cook it just the way you like best. Of course, the types of fish available are seasonal and you will need a valid Alaska fishing license. Apart from that, everything is taken care of, rods provided, hooks baited, fish filleted and either packed for you to take home, or cooked for your immediate enjoyment.